I love Thai food. This season just screams for soup. I thought I would pass along a favorite for us. This is my sister’s recipe. She got it from a friend who got it from a friend, so I don’t have the original person to give credit to. It tastes like any amazing Tom Khaa Gai you’d order at a Thai restaurant. This soup always satisfies. For those of you not too familiar with Thai food, I would encourage you to give it a try. This is a coconut based soup. You put rice on the bottom of the bowl and pour the soup over top. Don’t be overwhelmed by the number of steps in this recipe. Everything is written out, and it’s not as daunting as it may at first appear. 1. Put chicken in freezer for 30 minutes before slicing it in half lengthwise and then slicing it into very thin strips on the bias. 2. Remove tough outer leaves of the lemon grass stalks and use only the bottom 5 inches. Cut in half lengthwise and slice thinly crosswise. 4. Clean mushrooms, trim stems and cut into 1/4 inch slices. 5. Heat oil in large saucepan over medium heat until just simmering. 6. Add lemon grass, shallots, cilantro and 1 Tbsp fish sauce. Cook, stirring frequently, until just softened – about 2-5 minutes. (This is where I add in the kaffir lime leaves too). 7. Stir in chicken broth and 1 can coconut milk. 8. Bring to a simmer over high heat. 9. Cover, reduce heat to low, and simmer until flavors have blended, about 10 minutes. 10. Pour broth over a fine mesh strainer and discard the solids. 11. Rinse saucepan and return broth mixture to the pan. 12. Return pan to medium-high heat. 13. Stir in remaining can coconut milk and sugar to the broth. 14. Reduce heat to medium and add mushrooms. Cook until tender, 2-3 minutes. 15. Add chickens and cook, stirring constantly until no longer pink, 1-3 minutes. 16. Remove soup from heat. 17. 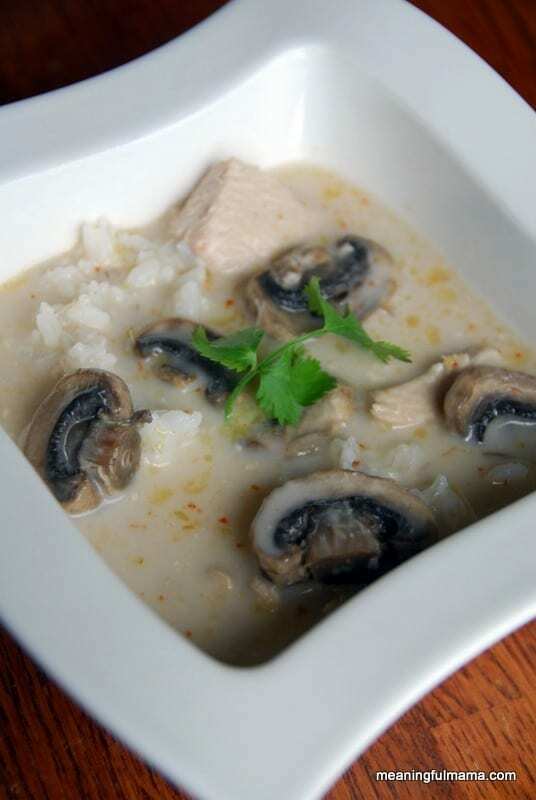 Combine lime juice, red curry paste, and remaining 1-2 Tbsp fish sauce into small bowl. Stir into soup. 18. Serve over rice. Garnish with cilantro and serve with lime wedges. Oh my gosh this was amazing! Best recipe yet! So much flavor!! So glad you liked it. I went to make it the other day on auto pilot and wasn’t thinking. I dumped all of my broth down the sink when I went to strain it. I was so disappointed, and I didn’t have enough time or ingredients to re-make. The up side is that I totally made something up that has a similar feel and my husband said, “This might be my favorite Thai dish.” I’ll be sharing it soon.